An innovative carrier management system to satisfy the business requirement! Presently, telecom service providers work with multiple carriers to optimize the costs. However, carrier and their rate management becomes overly complex manual task. Providers want visibility into their carrier costs for each route to develop competitive prices while optimizing their profitability. Several providers lack such visibility. Right information helps providers to negotiate better prices with their carriers. Providers win when carriers compete. Providers want to provide custom prices to its customers by analyzing customer’s traffic patterns. However, absence of such tool limits providers to standard prices. Carrier Rate Management System [CRMS] addresses ALL above challenges and provides much more features and intelligence to the providers. 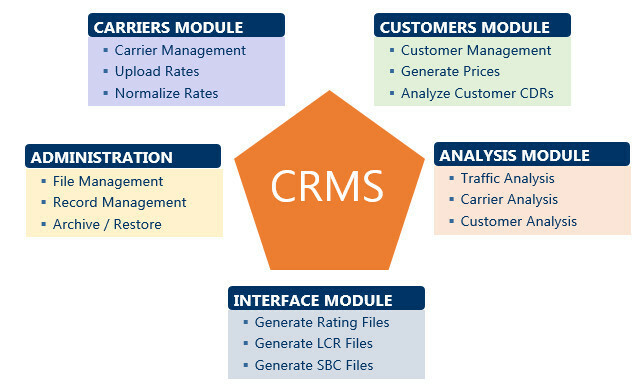 In a nutshell, CRMS allows you to effectively manage CARRIER RATES. Reduced process time from 1 week to 15 minutes! Upload and rate CDRs based on list of carrier rate sheets to analyze carrier rate change impacts and costs. Prepare internal comparative analysis to determine least cost carriers for each route. This analysis provides first 3 least cost carriers for each route. Prepare external comparative analysis that presents rate position of the selected carrier for all the routes in comparison with other carrier rates. Generate customer price list [sell list] by adjusting margins, markups, customer types, discounts, etc. across all carriers or to individual routes. Select carriers and rate sheet types to prepare the price list. Limit routes per customer to prepare customized price list. Analyze customer/prospect CDRs to provide predictive costs based on calculated price list. High availability and reliability. For years, the availability is over 99%. UI available for most of the administration activities such as archive and restore rate sheets and price lists, file management, LERG [Master Code List] management, etc.